Details relating to the German Commemorative of 2014. This is the ninth in the 16 part series of Germany, with each coin representing one of the German provinces. This year the province represented is “Niedersachsen”, and the motif chosen is St. Michael’s Church in Hildesheim. St. Michael’s Church was included in the UNESCO World Heritage program in 1985. Construction of a Benedictine monastery on the site of the church began around 996 – construction continued intermittently and the church was finally consecrated in 1031. In the inner circle of the coin we are shown a view of the church from the South East. The church is used to-day by several different Christian confessions. 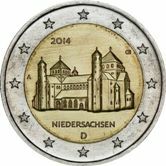 At the bottom of the inner circle is the inscription “NIEDERSACHSEN” and thereunder the country designation “D”. There year of issue is at eleven o’clock. Finally,the mint mark appesrs at nine o’clock and the designer’s mark at two o’clock. Return from German Commemorative 2014 to euro coin collector.